Is your partner sick and tired of constantly waking up when you watch TV while he or she is trying to sleep? You’re not alone, but those ridiculous dedicated TV headphones aren’t the answer. Instead, pick up an Mpow Bluetooth 4.1 Receiver and Transmitter on Amazon for $30. Just connect it to your TV, switch the audio output in the menu, and you’re done! You can now pair any Bluetooth headphones you already own with your television and enjoy all the late-night movies and shows you want without disturbing anyone else. 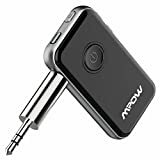 SAFE HANDD-FREE CALLING IN RX MODE:Mpow Bluetooth receiver is equipped with built-in micphone for hands-free calling while driving. Designed with independent volume “+/-” button to have a perfect control of voice up/down & playing/pausing.